The market for mid-sized sedans is so competitive that it has been hard for good products like the Mazda6 to find the sales success of the segment leading Accord and Camry. For the second generation Mazda6, Mazda has wrapped aggressive styling around a much larger car in an attempt to stand out. The wagon and 5-door hatchback are gone. Shoppers who appreciated the sharp styling of the CX-9 will find the new Mazda6 appealing. Mazda offers three trim levels: Sport, Touring, and Grand Touring. 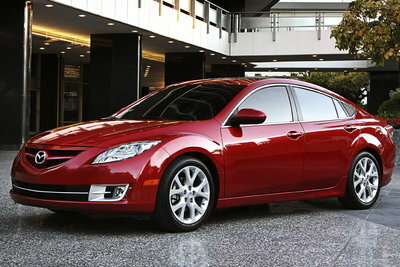 Each model is available with either a 2.5L four cylinder or 3.7L V6. With pricing ranging from the low twenties to just over $30,000, the Mazda6 is priced competitively with others in the segment. The U.S. now gets a dedicated version of the Mazda6 sedan. The wagon and 5-door hatchback models are no longer offered. The second-generation Mazda6 has grown appreciably larger in every dimension. In particular, the roughly 5 extra inches of length and 2 inches of width create a more spacious interior. The FWD Mazda6 retains a choice of four-cylinder and six-cylinder engines, both are more powerful than their predecessors were.